Bitter Minnesota offers Anniversary party Minneapolis brewery tours for groups of 4 or more. Tour regional breweries showcasing the newest, most unique, and award-winning craft beer Minneapolis has to offer. Let us help you design a memorable custom experience. We let you know your options, provide expert advice and take care of all the arrangements. We work directly with you to determine the best pick-up and drop-off locations in the greater Minneapolis/St. Paul metro area. Our little brew bus can pick you up and drop you off at home, hotel or favorite restaurant. We staff each one of our Anniversary party Minneapolis brewery tours with a friendly tasting guide to ensure a safe and memorable experience. Our guides help you make beer selections, answer questions and introduce brewery staff (when available). Maximum capacity on the Bitter Minnesota buses is 14 people. 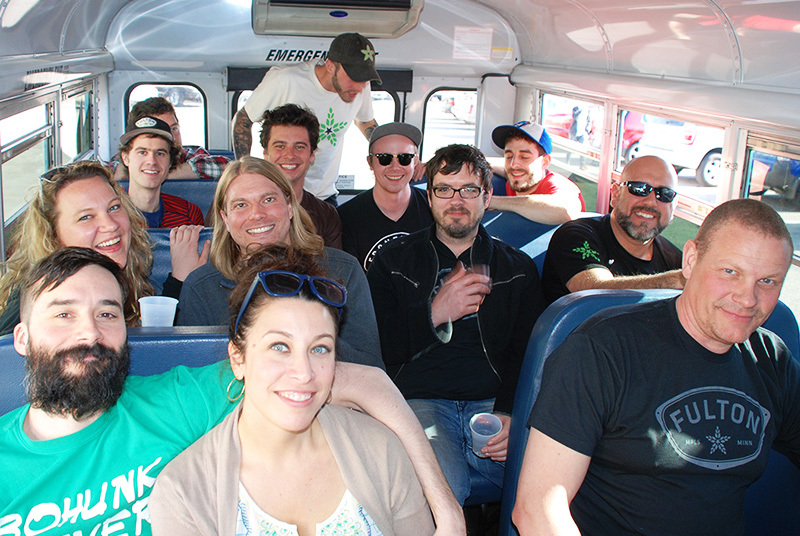 To accommodate larger parties, we run our buses together or use one of our local transportation partners. We currently run tours Monday through Saturday. Is there a particular date you prefer? How many stops would you prefer? Each stop is about an hour and our standard tours are 3 stops. Private tours can be up to 5 stops. Are there any specific breweries you would like to include on the tour? Would you like to include a tour of the brewing facility to learn how craft beer is made? This can be arranged based on availability. Would you like to include food in the tour price? All of our tours include food trucks, but we can include a sit-down dining experience upon request? Do you have anybody under 21 yrs of age? We can try to plan tours to accommodate some under 21 guests upon request. Our standard pick-up and drop-off point is at Grumpy’s downtown. We can arrange custom pick-up and drop-off location at an additional price.